There are some in the Formula 1 circus who will tell you that the rule changes have done the sport no good at all. That qualifying is no longer exciting and that the races may have been exciting but this is not because of the changes but rather because of circumstance. In Melbourne it was arguable but in Malaysia it was not. The day belonged to Kimi Raikkonen and after the race he was unusually talkative, particularly in Finnish. "I think that now they have changed the qualifying system you never know what other teams are doing and you have a chance. It was a good race for us. The tyres worked well. Michelin brought really good tyres for this race and the whole package was great. We put in so much effort over the winter and it is paying off now. It's good for all of us." We will never know what would have happened in a straight fight between the McLarens and Michael Schumacher. It was clear from the race pace of Rubens Barrichello that the Ferrari-Bridgestone combination was not as strong as the McLaren-Michelin one. Michael might have made a bit of a difference but Michael made a mistake because he needed to force his way to the front as quickly as possible because he was worried about David Coulthard getting the better of him at the start. The accident was most un-Schumacher-like and one can only wonder whether Michael was watching Coulthard more than he was watching Trulli the man he ran into. Was it that he had discounted the idea that the Renaults were a real challenge and was concentrating of DC? After the collision it was all over. Without it would Michael have won? It is difficult to say. But there is no point in worrying about the "what ifs" of motor racing. Schumacher had been under pressure and he had made a mistake. The first lap incident dropped him down the order and damaged a front wing. He decided that it was necessary to pit and then he had to return to pitlane again when the FIA Stewards decided that he should be given a drive-through penalty for causing an avoidable accident. By the time he had done all this he was in a position where not even Michael Schumacher can make up the difference. "It was a big surprise that I was still able to fight for points after I pitted for the drive-through penalty," he said. Michael ended the day sixth, which was a pretty good effort in the circumstances. The sad thing about the first lap accident is that it also put paid to the chances of two other major players: Rubens Barrichello and Juan Pablo Montoya. Barrichello had to take avoiding action and lost both time and track position. "Trulli ran wide and I had to dodge back inside him and that cost me a lot of time," he said. That meant that he had to pick off those who had got ahead before being able to go after Raikkonen and by that time he was struggling with the Bridgestones. Montoya was Williams's only real hope. Ralf Schumacher just did not look good, troubled it seemed by unsavory and unsettling allegations in a German magazine. He was off the pace in qualifying. The team hoped that Juan Pablo Montoya would do the business in the race but his hopes were dashed in the same accident. "I was hit from behind by Antonio Pizzonia's Jaguar and lost most of the rear wing," he said. This had to be changed and by the time Montoya was ready to depart the pits the leaders had covered two laps. "You cannot close a gap like that!" he said. The crash also put paid to Trulli's hopes of success. He recovered from being punted out but then lost time when he had a long pit stop which was blamed on the refuelling machine. He also had a spin all of his doing on lap 50. Jarno ended up finishing fifth, after a long fight with Jenson Button which ended up by him scrambling ahead of Button (with Michael Schumacher right behind him) on the last lap. In a flash Button went from fifth to seventh. When all is said and done however the Renault that people were watching was that of Alonso. Pole position was converted into a podium finish. Along the way Fernando had gearbox trouble and suffered because of a fever but he made it home and, according to team boss Flavio Briatore, the team "proved our choices in terms of strategy were correct". The strategy therefore must have been to go for a podium finish because the team understands that the car is not quick enough to take on the really big guys over a race distance. Asking for more than that was unreasonable. The man who ended up splitting the Renaults in the results was Ralf Schumacher, who profited from the first lap crashes and ended up ninth (from 17th on the grid). He moved to seventh when Coulthard stopped and Michael Schumacher pitted and his pit stop strategy (to run as long as possible) got him up to fourth. He rejoined fourth and stayed there for the rest of the afternoon. BAR had a rather miserable day which began with Jacques Villeneuve being unable to start because of an electrical problem. There was evidence that Jacques did not know the rules as he set off running off to the garage to get into the spare car (which he is not allowed to do). He then had to run back to his race car but this was going nowhere. Button made a good start to run fifth but he was clearly struggling to keep the pace and slipped back to sixth and then after the pit stops he began a battle with Trulli which continued right through to the finish. "I held off Jarno as long I could," he said, "at the last corner I braked where I normally would and the rear end locked up and I went straight on. That let Jarno and Michael through. It was very disappointing." 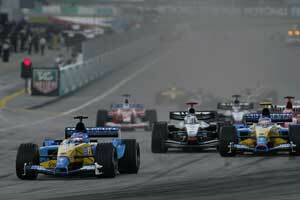 Eighth place behind this trio went to Nick Heidfeld but it was not a good day for Sauber. Frentzen was left on the grid at the start and although things looked good at the end of the first lap with Heidfeld getting through the crash to run third, it soon became clear that he could not sustain the pace of the fast boys. He slipped back to fourth and then at the first stop the engine stalled and a lot of time was lost. Frentzen's race was disrupted by a similar problem in the pitlane. he finished ninth, overtaking Ralph Firman on the last lap when the British driver ran out of fuel on the last lap. That was a great shame because Firman had done a good job with an unusual one stop strategy. He too had trouble in his pit stop but he proved that he deserves a place in F1, not least for refusing to be cowed when under extreme pressure from Trulli. Giancarlo Fisichella made a complete mess of his race. He went to the wrong grid slot and was busying reversing around on the grid. Charlie Whiting waited but when the lights finally went out Fisichella's Jordan did not budge. He blamed the launch control. Just behind Frentzen and Firman at the finish was Cristiano da Matta who had started the race from the pitlane in the spare car. This then developed a fuel pressure problem and so he had to run with a full tank (which meant three stops). "This made overtaking impossible," he said. Olivier Panis's race was short and sweet. He came through the first lap chaos in seventh position and then quickly moved up to fifth, running a light fuel load. When he rejoined after his stop the car died. Just as it had done in Melbourne. Jos Verstappen finished last several laps down having spent most of the race at the tail of the field after running into the back of Pizzonia when the Brazilian ran into Montoya. He charged hard all afternoon but there was nothing he could do. Justin Wilson impressed a lot in the early laps, obviously running with a light fuel load. He moved up to eighth but then dropped back as it was impossible to keep up that pace. As the race wore on he ran into more and more trouble with his HANS device and was forced to retire after 41 laps with no feeling in his arms. He was in such a state that he had to be taken to hospital. Jaguar Racing ended up as the only team not to finish a car. The fuel pick-up problem had not gone away and so the team decided to run the cars with heavy fuel loads. Mark Webber got through the first lap chaos and was up to seventh when he pitted on lap 15. There was a clutch problem as he tried to rejoin and he lost a lot of time. He battled on but was eventually called into the pits because his engine was using too much oil. Pizzonia lost out in the first corner shunt and so was a long way back. He ended up spinning into the gravel after 43 laps. Those who say that the new regulations do not produce good racing are kidding themselves. An unusual grid makes for an unusual race - and long may it continue.